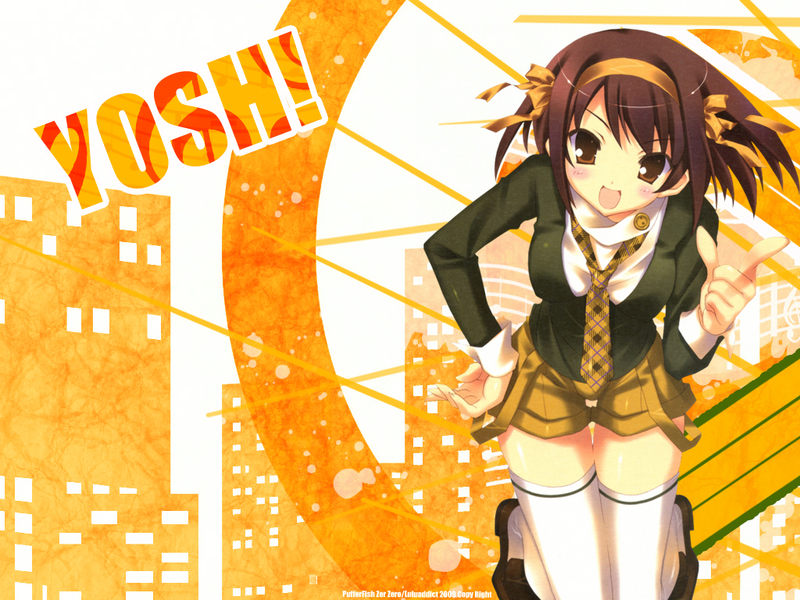 The Melancholy of Suzumiya Haruhi Wallpaper: YOSH! Minitokyo »	The Melancholy of Suzumiya Haruhi Wallpapers » The Melancholy of Suzumiya Haruhi Wallpaper: YOSH! Haha, I don't watch this anime. But I LOVE Haruhi. Shes really funny (although such a pervert of what I have seen) I fell in love with her character. So, here is Haruhi! I thought this matched her personalty...am I wrong? that said nothing about giving credit! but the brushes aren't mine! it s that wall only needs 15 minutes of time ? how ever this is a great wall thanks. Very beautiful colours - orange bright and sated =) it is pleasant to me very much! Suzumiya Haruhi is very beauty. She is my favorite hero in anime The Melancholy of Suzumiya Haruhi. When be to 2 season The Melancholy of Suzumiya Haruhi? Nice and cute. A bit too orangy for desktop but I like it a lot. cheers. haruhi-chan kawaii! love her pose.